Pardon the title, it is a lame attempt at the play of sound on the famous tongue twister - She sells seashells by the seashore. This is just a little (more like long-winded) update on the plants at 13th floor. The chili plants are doing well at this time, all green and flowering profusely on the balcony. Both the Bishop’s Crown and Bird chili are in flower, so no seeds will be collected for fear of getting ‘Frankenstein’ chili crosses that would probably be sterile in the next generation. Bird Chili (C. fructescens) showing off their pretty whitish off-green flowers. 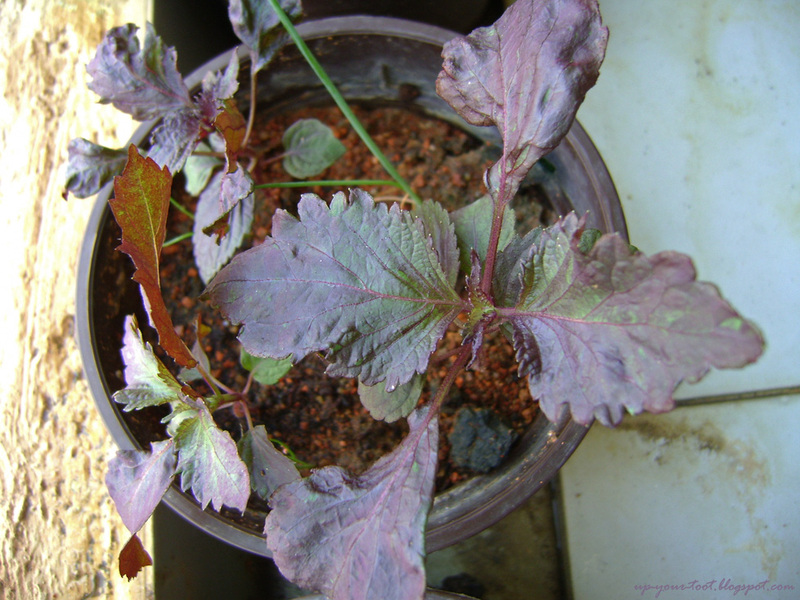 The Purple Shiso (Perilla fructescens) from a Koppert Cress microgreens container seems to be doing well in soil and still retained the purple colouration on its leaves in warm tropical weather. This is in contrast with most of the purple basil cultivars that will only show a few purple streaking when cultivated in warmer weather. However, the strong sunlight coupled with the tropical heat may actually push the Shiso plant to bolt prematurely, so I have to keep an eye on that. The Purple Shiso (紫苏) from Koppert Cress - just slight bleeding of the purple colour in the tropical heat. Bulbs from Diana are all popping up and growing well. The first to be planted was the Ixia. Unfortunately, I had waited too long to plant them and they were pretty shriveled up due to the low humidity. To add insult to injury, I had to leave them unattended after putting them in for three days due to a meeting that I had to attend. Consequently, only two out of an embarrassingly large number of corms germinated. Those planted in a smaller pot, and hence exposed to drying out again did not make it at all. The Ixia in the same container as the strawberries. 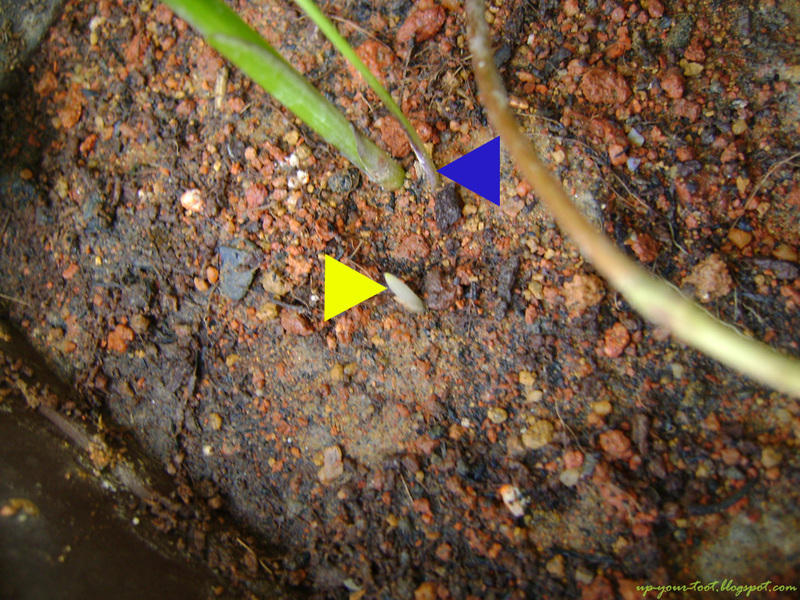 Blue arrow points to a second growing point from one corm. Yellow arrow indicates a new growth - not too sure where that came from. Perhaps a third lead as I did not plant them that close! Only two from the container that housed some strawberry plants did as the bed is lined with grass fiber of some sort and retains a lot more moisture. However, due to the fiber material, I do get the occasional unidentified mushroom popping out, but no; I am not growing magic shrooms. What I am quite happy with is that for both bulbs, there are two leads, meaning that if they successfully form corms at the end of the season, I should get two plants out of the single corm that I’ve planted. The strawberry is doing fine though. 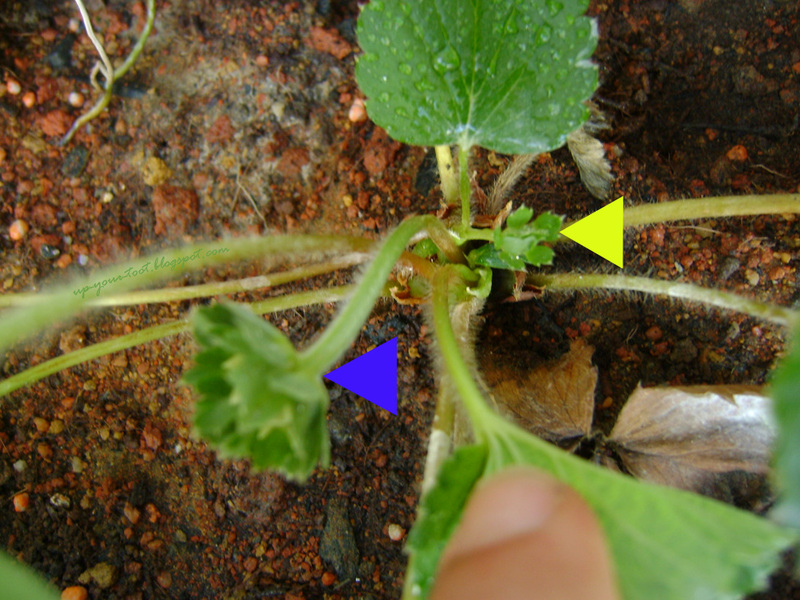 The blue arrow points to a fused, double flower (fused stalk, normal flower) and the yellow arrow to a smaller, normal flower. The two flowers open simultaneously. Hopefully there are enough matured pollen grains to pollinate both the flowers. Next to go into the soil was the generous offering of Star of Bethlehem. The Star of Bethlehem is also known by names like dove’s dung, sleepydick, nap-at-noon and Pyrenees Star of Bethlehem. Out of the three bulbs, one didn’t make it. I probably should have soaked all of the corms in Carbendazim and Zineb before planting them to minimize losses due to rot but I did not. 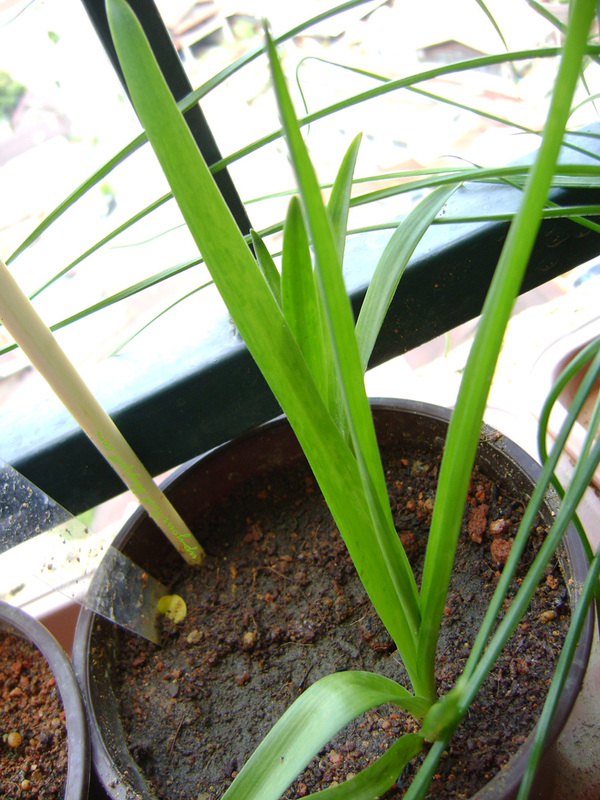 Two out of the three Star of Bethlehem that I put into the pot grew. Seems to have stalled in growth, plus some worrying mosaic patterning of the leaves. A tuff of leaves grew out of them, but I am worried as they appeared to have stalled in growth. Ornithogalum umbellatum L. is supposedly an easy bulb with the tendency to take over lawns/pastures and it is considered a noxious/invasive weed in some places. Also all parts of the plant and especially bulbs are toxic to animals and also humans (if enough is eaten) due to the cardiac glycosides present in the plant. I am banging on the fact that they are supposed to be aggressive growers that they should do well over here. At the same time, I also planted 3 King Fabiola corms (a selected cultivar of Triteleia laxa Benth., formerly Brodiaea laxa). A week later, another 3 was planted into a second pot. After seeing that the Ixia wasn’t growing, I also tipped the first King Fabiola pot over to look for rotting corms. Alas, curiosity almost killed the cat, for one of them were already putting out roots (of which many were broken) and the other two were just starting to show signs of life. So after a dip in fungicides, they got repotted back. Pot No. 1 with King Fabiolas that survived being dumped out and a second re-potting. A week later, all pots were showing signs of life. This corm is one that I truly regret not getting more from Diana, for the corms are also edible, besides the pretty blue flowers that they produce. A native of North-Western US, the corms supposedly taste good when eaten raw and if cooked, has a taste similar to potatoes. The Dutch developed the fragrant Queen Fabiola cultivar (and perhaps also the larger King Fabiola?) for the cut flower industry. Another pot of King Fabiola - this one appears to produce multiple shoots from each of the planted corms. NOTE: This plant has flowered in our local condition - click here to see the post about it. The Sparaxis are the most reliable in terms of ‘sprouting’, so to speak. 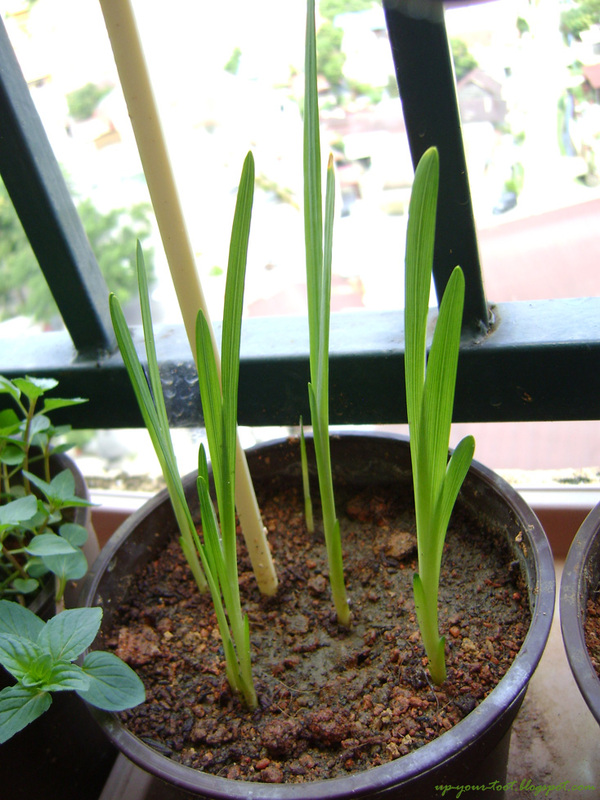 Put in one corm and you get a few growing points… The only worry is that Sparaxis might sulk in our moist, tropical heat. If I am not mistaken, in 2000 when I went for a workshop in Japan, I brought back gladioli, calla lilies, Sparaxis and Primulas. The Primulas were the first to go, followed by the Sparaxis. It could partly be my fault as the Sparaxis and Primulas were fully grown and didn’t like the transplant shock plus the weather change from Osaka to Kajang. The Gladioli were the most successful whilst the Calla lily didn’t form strong tubers for the next year. So keeping everything crossed for the Sparaxis this time. Sparaxis all popping out and reaching for the sky. The leafy veggies from Diana are far more outstanding than the bulbs. The Chinese broccoli, better known as Kai Lan are crazy in their own way. I sowed some seeds here and there (and looks like it is everywhere) and when they sprout they literally just bounce to life like Energizer bunnies. Err Diana, what did you feed their parent plants? Rabbit poo? Now I am not into organic growing, but rather believe in efficient use of chemicals (as opposed to indiscriminate wastage of chemicals). 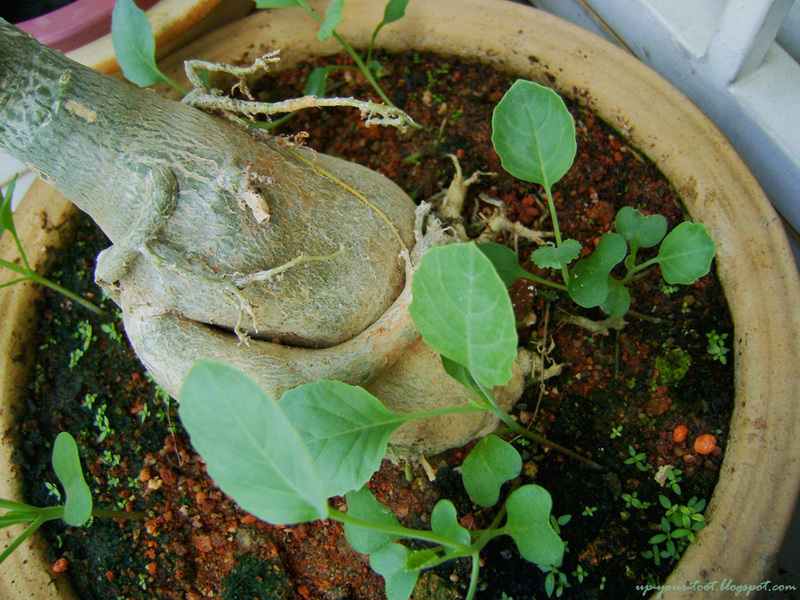 Kai Lan seedlings sharing a home with the Adenium obesum. The pot needs to be weeded again, for Oldenlandia corymbosa seedlings are still coming up despite being removed continuously. 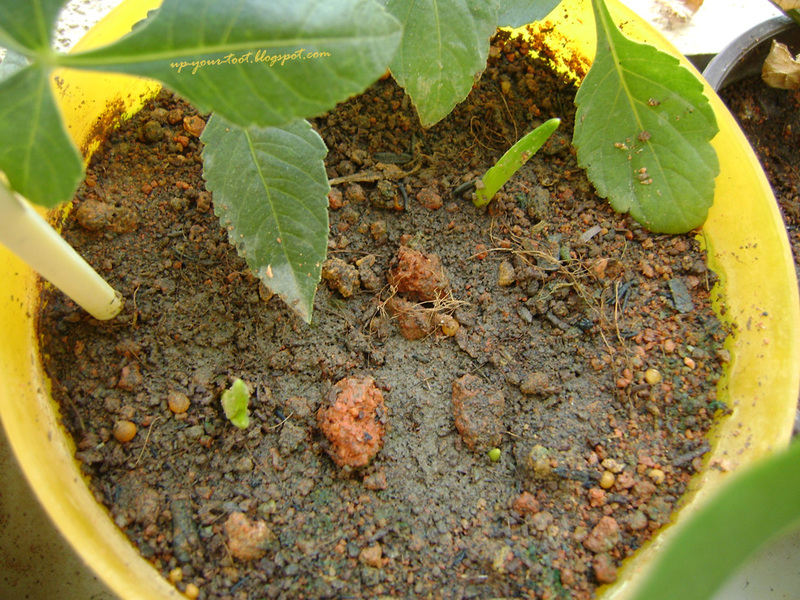 More Kai Lan seedlings...Sorry Diana, saya pakai teknik 'buang anak' bila nak semai benih ni. Tak sistematik macam Diana. 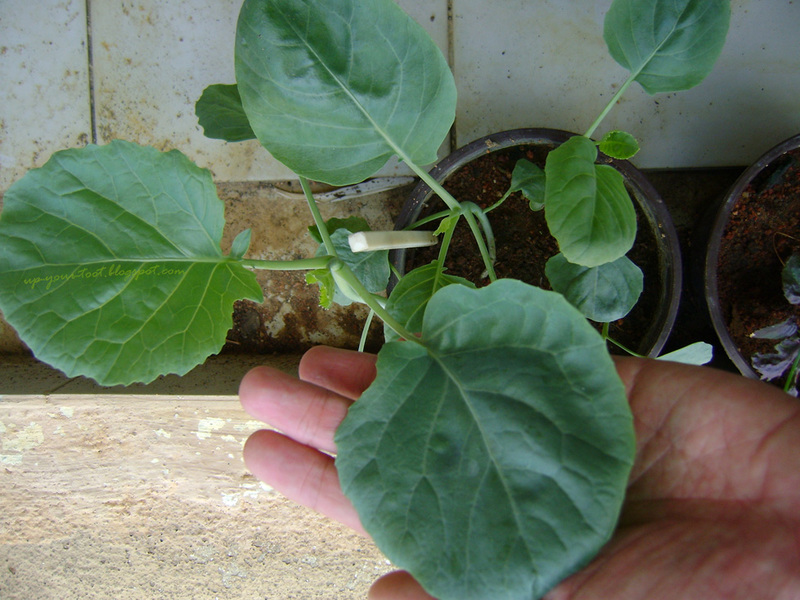 The Kai Lan (seeds are available from here) are in small pots (or they share a pot with other plants), thus they get fed a diluted fertilizer in their water every two or three days. 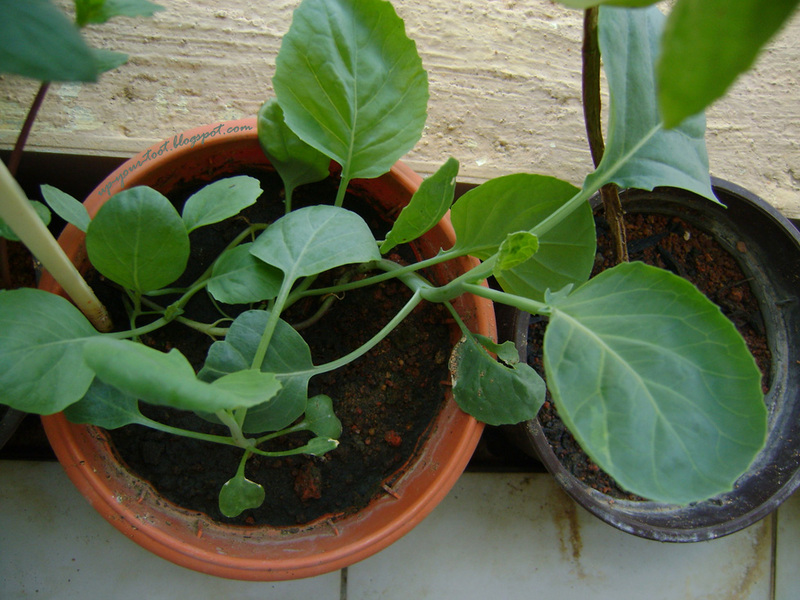 The two pictures below are of the same pot, about two days apart. Look at the size of the leaf as it expands. I like the texture of young Kai Lan, but sometimes the flavour can be quite strong, so I will probably leave it alone for a while before harvesting it. Some people might find young cruciferous vegetable more revolting, especially super-tasters (people who can taste PTC or PROP) as they will be able to pick out the ‘bitter’ taste much easier in young cruciferous vegetables. Two days later, the new leaf had expanded to as large as my palm! The Red Romaine lettuce is also having a go. I did have a spider mite issue (and still do), and the resultant spraying resulted in the loss of a few seedlings. Since mites (false and real spider mites) love plants from the Compositae family, the Dahlia, and the lettuce become prime targets. 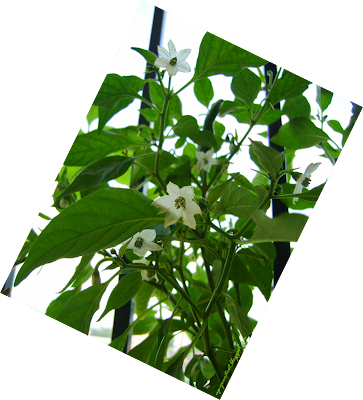 Okay, they also love to attack the chili peppers, and have totally defoliated the bird chili plant before. For the same reason I have always failed to successfully grow dandelions, since the plants get smothered to death by mites. Like they say, once you have mites, they never go away. 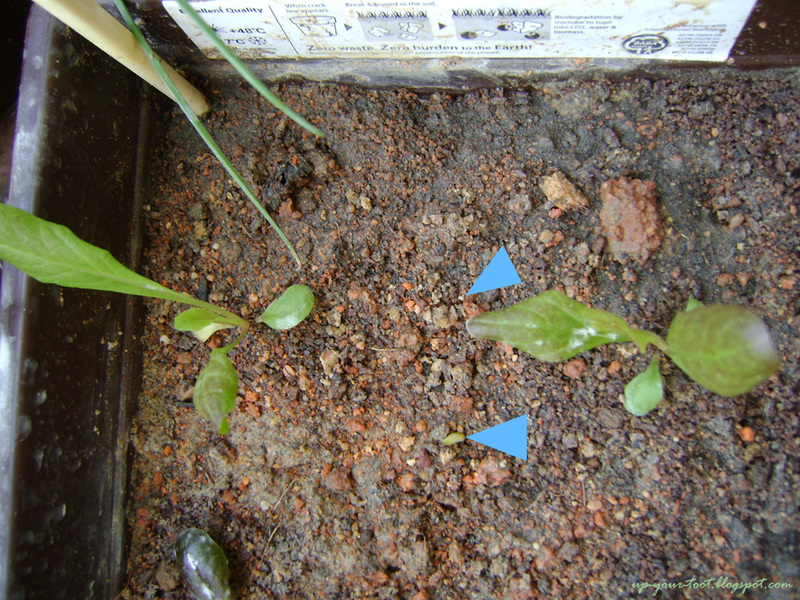 Sparaxis popping up (blue arrows) between the Red Romaine lettuce. Yup, the balcony is getting crowded…Got to keep an eye out for mealy bugs and the ever irritatingly present spider mites. I found chilli and capsicum rarely cross-pollinate between each other. So I think you can have a go saving the seeds. More easy to collect seeds from them compared to brassica and cucurbit. What type of strawberry plant are you growing? Dekat kebun Sungai Buloh buah strawberry selalu ayam mutiara je yang makan. I don't have sweetie strawberry anymore here in Adelaide, semua dah bagi ke Sungai Buloh tinggal Alpine strawberry je. 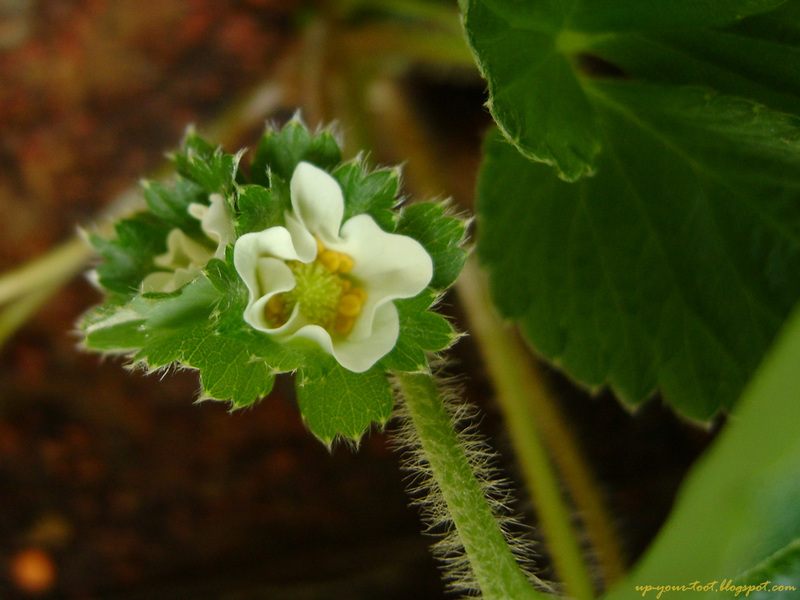 Nasib Alpine strawberry tu each year self-seed. Sekarang tengah mencari Torrey strawberry sebab yang ni elok for warmer climate yang biasa Queensland tanam. Thank you for sharing the newly sprouted seedlinngs look like. No matter how I pujuk my siblings to take photos of them tak kesampaian gambar apa rupa benih-benih yang tanam kat Sungai Buloh sekarang. I see. So bolehler seed save nanti. Strawberry ini dr CH memang NOID sebab org Malaysia tak appreciate cultivars. This one yang boleh berbuah besar selalu ada primary-secondary-tertiary flowers even in lowland. 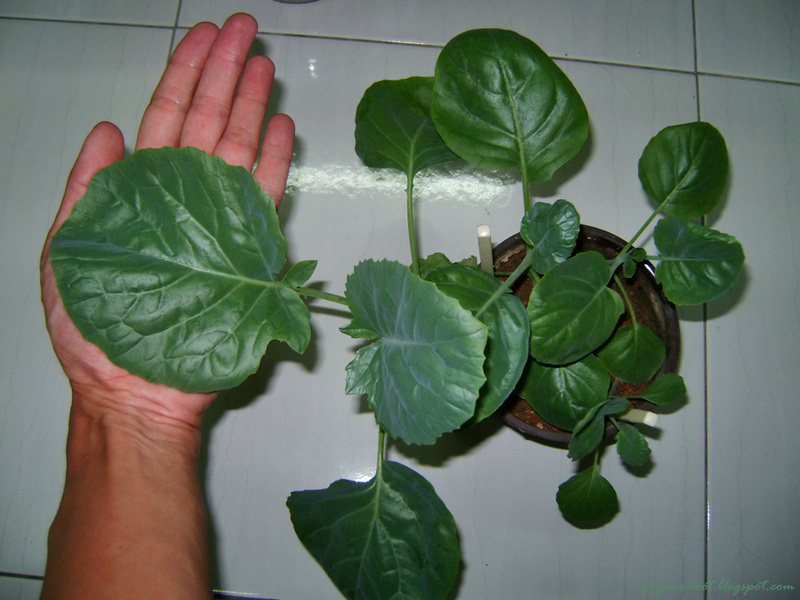 There is another CH grown cultivar that only produce a primary flower - yang tu keluar buah 0.5cmx0.5cm. Sweetie is supposed to be quite tolerent of heat. Mereka tak biasa buat sesi photo dgn pokok kot, hehe. Oh parent kailan tu dibagi horse poo compliment from Morphetville racecourse stable campur with our green and kitchen waste. Your kailan seedlings look really healthy boleh makan tak lama lagi. Ours are about to flower due to the cold weather. Ohh, patutlah melonjak je pertumbuhannya, lol. Thanks, I tak terfikir lagi nak masak apa dgn kailan. I love baby kailan and microgreens, tapi tak sampai hati nak petik lagi. tapi memang weather shock dari highland ke lowland, panas lagi..african lily dari Cameron dah kiok dah... amarylis dan rosemary masih bertahan..
Kak Mar, saya beli dari penjual di KL, dia kata dari Cameron. Tak pasti pulak jenis apa sebab mereka tak tahu. Kak Mar selalu naik Cameron ke? Kat Cameron yang ada adalah Camarosa, Camaroga, Chandler, Tioga, Gauntlet dan satu dua jenis kultivar Jepun ditanam. Kalau orang MArdi beritahu cultivar tu dan lepas tu tak berjaya, by process of elimination boleh dapat cultivar yg boleh hidup senang di lowland.